Over the past four years, a quiet revolution has been brewing in international education, focused in Southeast Asia. The topic is sustainability, of course — and the method is “Compass Education,” a set of tools and approaches that put the AtKisson Group’s “Sustainability Compass” at the heart of school management, operations, and classroom teaching. For some of these international English-language schools, the Compass has become an essential part of everyone’s educational experience — from first graders to board members. Now, the Compass Education Team has spun itself out of AtKisson, Inc., as an independent, non-profit organization (though it will remain a part of the AtKisson Group network, just like several other non-profits). 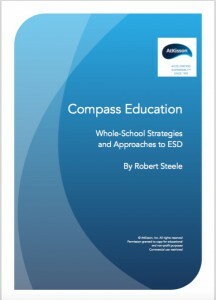 And program coordinator Robert Steele has written and excellent, comprehensive review of the Compass Education approach. Download it here, and then contact Compass Education directly for more information about their training programs and advisory services … which are for schools and teachers everywhere, not just Southeast Asia.